But you say i'm chic as can be! And we can toast the fact we ain't dead yet! Aw Edna baby dance with me! Oh Wilbur! You make me feel like a girl again! Oh honey show em' the bumper! Oh honey I think my bumper's stuck in nuertral! Whaddya think of this one big boy? Can ya feel that all the way over there? You're fat and old, but baby, boring you ain't! 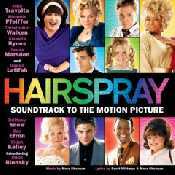 - Álbum "Hairspray (Soundtrack To The Motion Picture)" del año (2007)	.